We had a great Summer! Join us next year! Like our Facebook page and follow us on Twitter @CampAlexander! Empowering children by providing a safe place for growth and enrichment in the great outdoors and a respect for the environment. 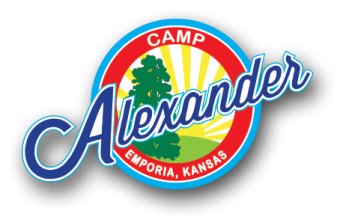 Located in Lyon County Kansas, east of Emporia, Camp Alexander provides 90 acres of stunning outdoor adventure filled with plush woods, ponds and rolling meadows. Whether you are looking for a serene walk in the woods or want to build upon your fitness program, Camp Alexander provides nearly five miles of challenging hiking and biking trails traversing thick woods and open meadows. A nine hole disc golf course is entertaining for all skill levels. Nestled in a wooded backdrop, our Fitness Trail provides a great whole-body workout. And don’t miss out on the newly added Flow Trail; a quarter mile of mountain bike thrills. Camp Alexander’s premier focus is our Summer Day Camp. Each summer from June through August, the entire camp is bustling with activity as children and teens run off their energy, explore their creative side, experience the wonders of nature and get wet ‘n wild. Camp Alexander provides kids of Lyon County with an experience like no other in the area. Join us for one week or the whole summer! Camp Alexander is thankful for the gracious support of the United Way of the Flint Hills. Learn more about our facilities. Rentals are available!